As a single man that has trouble finding people to regularly play board games with, it made sense to have a show about solitaire boardgaming with Bruce Geryk and Tom Chick. We start with Phantom Leader on the iPad and then work our way through a bunch of different games talking about what makes a good solitaire experience, why it is different from playing against a computer AI and just how far a good theme and production values can get you. You can download the mp3 directly from here and go visit the official forum to chip in some of your experiences playing with yourself. 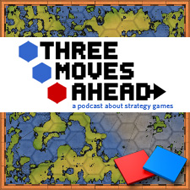 Overall this was a great podcast (I’m so glad word about how good Nemo’s War is seems to be getting out, and please try to get Chris Taylor and Alan Emrich on the show), but it would have benefited from some more research into Victory Point Games. While in the past they have been known for great and daring designs and atrocious desktop publishing production values, things are changing dramatically. They upgraded their printer, bought a laser cutter that lets them make some of the thickest chits in the business, are producing full-sized cards, and are making some beautiful stuff. You can even get them in nice boxes with mounted maps now instead of in a baggie with a paper map. All games are getting slowly upgraded, and you know the ones that have received the full treatment by their Gold Banner designation. Levee En Masse is mentioned in the podcast, and while I am in full agreement that the mechanisms are too simplistic to carry the game, it is part of the States Of Siege series that has much better entries. All of them have a base mechanism of fighting back enemies on multiple fronts that are driven by event cards, but they differ so much in theme and complexity that you can’t really lump the whole series together. One of the best examples is Dawn of the Zeds, where players control heroes and larger mobs of militia in defending a city and its outlying areas from a zombie onslaught. It operates on a scale that is much different from those of most zombie games, and really makes the most of the States Of Siege engine. They are working on a deluxe Gold Banner version with a lot of extra components that should be amazing. Now I’m holding out for a second installment where Bruce gives a play-by-play of D-Day At Omaha Beach. High scores keep you connected to your history. My Grandmother’s old Yahtzee game has a running tally of my Dad’s, Grandmother’s, and Great Uncle’s high scores on the top of the box. Even after my Grandmother passed away, my Dad’s kept the game around. It’s a great reminder that how lots of different games can be great with the right people. Now that VPG has upgraded its equipment (and due to delays with the new game being developed for the GMT three-pack), GMT has dropped its plans to publish deluxe versions and they are back in VPG’s capable hands.